Montefiore II is located directly across the street from Montefiore I at 3450 Wayne Avenue, Bronx, NY 10467. This property is close to all campuses. This 28 story high rise offers air conditioning conditioning, laundry facilities, high-speed elevators and 24-hour guard service. 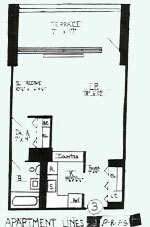 Apartment sizes range from studios to two bedrooms. All units offer balconies, air conditioning, a refrigerator and a gas range. Electricity and gas are included in the montly rental charge. No pets are allowed. Housing units are not furnished. *Please be aware that this property has limited availability. We are unable to offer additional storage space to tenants. Parking is limited and is available at an extra cost. Tenants may apply for parking at the 210th Street Parking Garage. Below are the rental amounts, estimated square footage and apartment layouts. The estimates are approximate and are meant as a guideline. 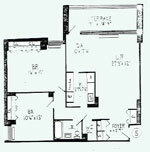 Actual rent and apartment layout varies from unit to unit. 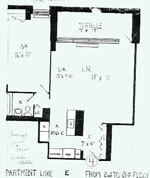 Layouts are not exact for each apartment; it is a general overview. Rent at this property was scheduled to increase three percent on September 1. To apply for Montefiore Housing, please click HERE.